Update 19 – CRPG BOOK RELEASED! 1) Physical Edition – This is the question I’m asked the most: “Will there be a physical edition?”. I would love to have one, but it’s something very complicated to produce – especially for a 528-page color book! Most on-demand printing services won’t do something this big, and even if I cut the book down to CreateSpace’s 480-page limit, it would be a VERY expensive book, costing over $60! 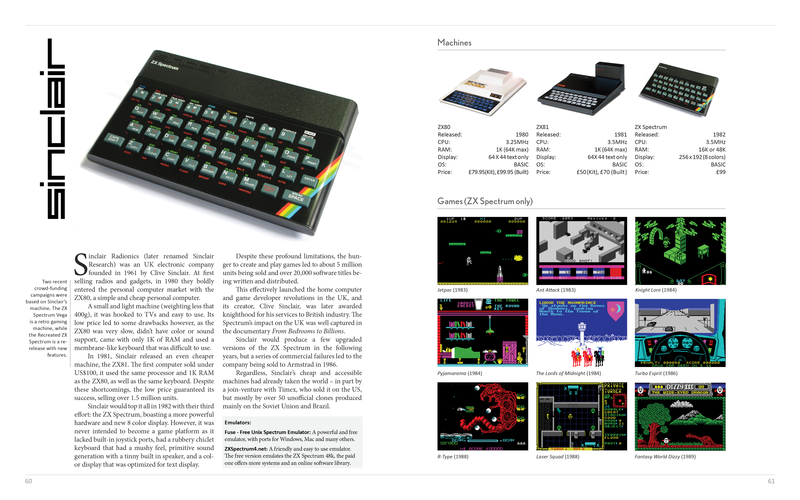 There’s also a few extra articles I would like to include, such as a timeline on MMORPGs & MUDs and short introductions to old home computers, such as the C64, Amiga, ZX Spectrum, TRS-80, etc, which I’m guessing many readers never saw and know little about. I had a draft for the latter, but unfortunately couldn’t find enough teach-savvy volunteers to write them. Update 18 – RELEASE DATE: February 5! Hey everyone, it has been a while… in fact, almost a year! 2017 was a busy year for me, but had a great pay off. I spent months job hunting and finally landed a job, and also managed to learn enough moonrunes to pass JLPT N3. Update 17 – The Final Preview! It’s finally here! I present you our fifth release, the 450-page preview of the CRPG Book! This will be the last “alpha preview”, as the book is very close to be completed. The big updates here are the computer history timeline, which is finally completed, and the addition of hyperlinks and .pdf bookmarks – perhaps our most requested feature. Sadly, the pace of new review in the past months has been extremely slow, so if you’re interested in writing a review for the CRPG Book, please do so! We could use the help! Feel free to use them as you like, and if there’s any screenshots of your own you would like to submit to the gallery, just e-mail them to me. Cheers! Those who follow me on twitter probably saw it, but I’ve wrote an extensive article on the origins of JRPGs for Gamasutra, and this section is an abridged version of that article. More will likely follow, as I plan to use this format to create a brief timeline giving readers some context on what was going on with JRPGs and MMORPGs (possibly tabletop RPGs too) in parallel with the main CRPG timeline. Other improvements include updating old reviews, re-doing unsatisfying ones, adding hyperlinks and FINALLY making sure font sizes are consistent throughout the book. As usual, I intend to post the next release by December – and it will likely be the final “preview”. Motoya Ataka has a long tradition with those. He began at the source, working in Wizardry Empire games in the early 2000’s, then eventually directing his own spin-off at Michaelsoft: the Wizardry Xth series, which moved the setting from medieval fantasy to modern day Japan. The game was well-received, but Michaelsoft closed down, so Ataka-san took his team, called “Team Muramasa”, and founded is own company, Experience Inc. There he created the Generation Xth trilogy, a “spiritual sucessor” to Wizardry Xth, and just kept pushing out DRPGs: Labyrinth Cross Blood, Operation Abyss, Students of the Round, Demon Gaze, Ray Gigant and the recently localized Stranger in Sword City. Ataka-san, you created many Dungeon RPGs, a type of game that isn’t made anymore in the West but is still very popular in Japan. What is your favorite aspect of this style of game? I believe the genre lends itself easily to various surprises and innovations born from the activity (interactivity) of the user, the path to and realization of a goal, and lucky occurrences and unforeseen accidents. So, I would say the answer is to evoke such things through game design. Strangers in Sword City is the first of your games to be released in English on Steam, and was very well received by critics and fans. Are you surprised by this reception? Do you plan to bring more games to Steam? While we were surprised by how well the game seemed to have been received, we are very happy to see that players are enjoying themselves! In regards to new releases on Steam we currently have nothing scheduled. A new, updated version of Stranger in Sword City was recently released in Japan, featuring three new classes and many other improvements. Are there any plans to also update the English Steam version? Some of your games were exclusive for Windows, others were exclusive for consoles. Do you think PC gamers are much different from console gamers? Do you plan the game’s design around those differences? At the time when Generation Xth was released to the Japanese users, I do not believe there was a large difference. In particular for both PC and console games, we do not really consciously create design differences. I’ve read that Wizardry V is your favorite Wizardry game. It was a game with many hard puzzles and riddles, but your games and most Japanese DRPGs tend to avoid those. Why is that? Titles created by our company, while not in large numbers do use some puzzles and riddles. While it is a matter of taste with titles, we would like to consider including more to the best of our abilities if a title requires such features in the future. After Wizardry V the series radically changed – Wizardry VI removed the town, Wizardry VII had a large open world map and Wizardry 8 was fully 3D. However, Japanese DRPGs still mostly follow the Wizardry I-III formula. Why you think that is? And would you like to one day make a game influenced by these other games, like an open-world map or a fully 3D DRPG? Many of our fans love the traditional DRPG style, so as a developer, I want to meet those expectations. Furthermore, there already exist many new high-end interpretations of the DRPG genre, so I mostly want to admire it from a user’s standpoint. All your DRPGs are turn-based. Have you ever thought of doing a real-time one, like Dungeon Master or Might & Magic VI? Personally it is a game that I like, therefore if chance allows it I would like to try my hand at making one. Do you still play Western RPGs? Which are your favorite recent ones? Although it was a while back, I managed to clear Fallout 4. I really enjoyed how it linked the modern setting that helped immerse the player in the game world. Finally, the RPG Codex interviewed Robert Woodhead, creator of Wizardry, and he said he has no idea why Wizardry is so popular in Japan. What would you tell him? I remember when I played Wizardry as a child, the game was so intellectual – and the people who played it seemed so cool – that it completely blew away the stereotypical image of the video game otaku. During the genesis of the Japanese RPG (the Famicom’s prime), such an awe-inspiring game coming from the West shook up the Japanese RPG genre and would captivate gamers’ hearts for years to come. My deepest thanks to Ataka-san for his time, and for the Experience Inc. staff members who made this interview possible. D.W. Bradley is best known as the man behind the second wave of Wizardry games. Wizardry VII: Crusaders of the Dark Savant (1992) took the series to new heights with a large non-linear open world, where several alien factions searching for a legendary artifact – with NPC parties roaming the land and looting dungeons alongside the player. After that he worked with Warren Spector at Origin on CyberMage: Darklight Awakening (1995), an early FPS\RPG hybrid, then went on to found his own company – Heuristic Park – and release two more RPGs: the vastly underrated Wizards & Warriors (2000) and the recently re-released Dungeon Lords (2005). In Wizardry VI: Bane of the Cosmic Forge the dungeon door closes as soon as you enter – there’s no town to return to. The old Wizardry loop of exploring, killing, looting and going back was removed. What led you to change the series’s gameplay in this way? The rival parties in Wizardry VII: Crusaders of the Dark Savant are one of its most outstanding features – and one that has never been done by any other RPG. What are your thoughts on them? DWB: While working on Crusaders of the Dark Savant my mind was soaring, and this innovation was only the beginning of more amazing things to come. Alas, Crusaders was my last Wizardry title. On its heels came the advent of 3D, Doom and real-time, and as video games went mainstream, recognizable brand name and blowing people up commanded massive profits, while with rare exception innovation in game paradigms were costly, and all too often ended in failed titles. When I was young and working on my first computer games (text on teletype! ), I could see with clarity what would one day be possible, and this sight has always illuminated my path. What I didn’t know was how far we could go in my lifetime, inevitable though it was. This vision is almost realized in the caliber of 3D games today, and VR promises more to come, yet there remains a dimension of computer simulation not yet manifest, almost untouched. It was from this wellspring that the feature you speak of emerged. The sight of it remains clear to me, and though it is not yet made, it shall one day come to pass. The question is when and by whom, and who shall be there to experience it?